See both the European and Asian sides of Istanbul on a 2.5-hour boat cruise of the Bosphorus Strait. Get the opportunity to visit an Ottoman palace on the Asian side. Benefit from pick-up at your hotel in central Istanbul, and then go to Eminonu Pier to embark on a boat trip along the Bosphorus Strait. Explore the sights of the European side of the city for around 1 hour, passing historical monuments such as Galata Tower, Dolmabahçe Palace, Çırağan Palace, the Ortaköy Mosque and the fortress of Rumelihisarı, built by the Ottoman Sultan Mehmed II in the 15th century. Continue to the second bridge to head to the Asian side of Istanbul. Visit Küçüksu Palace, built in the 19th century as a hunting lodge for the Ottoman sultans. Make your way back to the city center, following the Asian coast, and get a look at the Anatolian Fortress (Anadoluhisarı) and Turkey's oldest military school at Kuleli Military High School. Admire the elaborate Beylerbeyi Palace, built as a summer residence for the Ottoman rulers in the1860s, and see the Maiden’s Tower guarding the entrance to the Bosphorus Strait as you get ready to disembark. Coming to Turkey for the first time from the states, I was definitely nervous when it came to navigating around the city and finding a tour guide service that was safe and affordable. 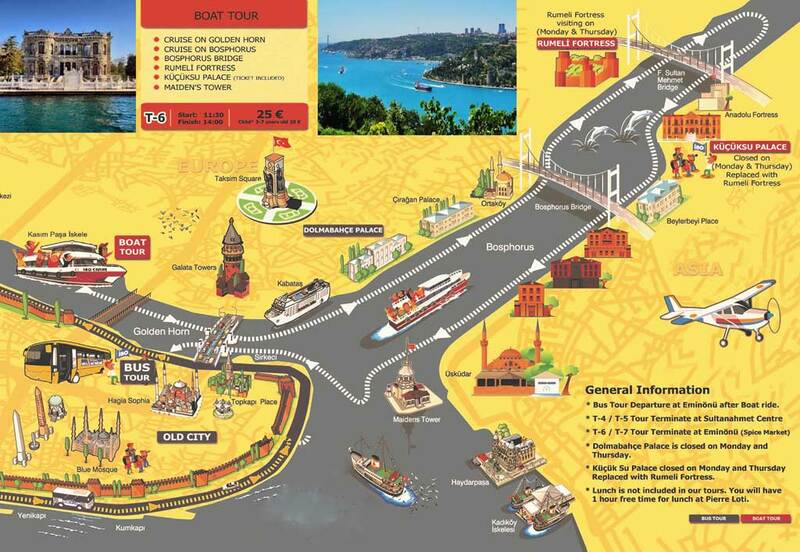 The hotel had brochures for other tours that were the same price as Bosphorus Tours with very similar routes but decided to take a chance with Bosphorus Tours instead. I can't tell you how happy I was with that decision. The pick-up from the hotel was on time and the tour went exactly as planned, ut the highlight of the tour was our guide, Taner. He was so helpful and accommodating. He stayed with my mom and me well past the tour and went above and beyond in showing us the surrounding areas and answering all of our questions. He even stayed behind when my mom got tired or needed to use the bathroom. I was so pleased with how knowledgeable he was of Istanbul and the area. Thank you for the wonderful tour. Scenic boat cruise along Bosphorus strait! Spent a couple of hours cruising along Bosphorus on my third day travelling in Istanbul. Water can be a little choppy on a windy day but I thought it added to the overall experiences and fun! Very fun and enjoyable cruise, the tour guide was super friendly, very well informed and very professional! It's a great cruise for a couples. This cruise provides a very good introduction to the Islamic as well as the cosmopolitan aspects of the Ottoman empire -- the European as well as Moslem influences on its civilization. You bridge the east and west, and the buildings visited reflect that. The boat is not packed the way many cruises are, so you get to move around leisurely. It is a relaxing and instructive tour. This tour was a lovely relaxed way to see Istanbul beyond the old city area. The tour guide provided lots of interesting information, we had plenty to time see things at each of the sites and the boat was very comfortable. I would highly recommend this experience with this group. The waffles at ortakoy were the best-be sure to treat yourself to one! Awesome memories that don't burn a hole in your pocket! We hired the Bosphorus Tours for all our tourist excursions in Istanbul. Even though the tourist companies in Istanbul are notorious for ripping you off but Mr.Tugrul at Bosphorus Tours was a an absolute delight! Despite being out of station, he guided us through various options with packages which easily beat the commercial companies by HALF! His team was professional and warm. We took a full day tour at the Princess' Islands, a full day tour to the major attractions around the Blue Mosque and we took a tour of Bosphorus by Night. Each expedition was worth every penny paid. To top it off, I forgot my mobile in one of their buses after one of the tours and the driver actually found it and got it back to our hotel within an hour! I booked the half day Bosphorus Tours on line and received a prompt response and the tour lived up to expectations. Our guide "Taner" was knowledgeable and easy to warm too and looked after his customers with the Turkish charm that made the whole trip enjoyable. Fully recommend to others. Contacted this company on social media, extremely helpful, polite and always there for you. Very very competitive pricing and budget friendly packages for everything you need for your tour. Am very thankful for making my tour memorable. There punctuality, commitment and deliverance all are just excellent and perfect.